Do you have an anti-social garden? Is there a pretty bamboo like plant that appears in your garden during summer, which comes back year after year, with lovely white flowers and grows up to approximately 7 metres in height? If so, your garden could be harbouring Japanese Knotweed. Whilst the presence of Japanese Knotweed in your garden is not illegal, if it is deemed to be having a detrimental effect on neighbouring property and not being kept under control, action could be brought against you and you could find yourself receiving a Community Protection Notice under the Anti-Social Behaviour, Crime and Policing Act 2014. In more extreme cases, you could even face a custodial sentence! As the land owner, the onus is on you to control and remedy the problem. Typically it is at this time of the year that Japanese Knotweed likes to reappear. Its starts off as little shoots (looking very similar to asparagus), with bright pink buds, these then open up into green heart shaped leaves. The shoots can grow as much as 10 cm in height per day and once fully grown, it can be as tall as 7 meters – not something easy to miss! 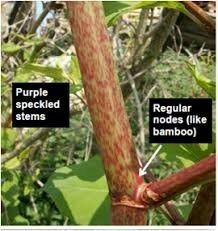 The stems themselves are hollow and mainly green but have a distinctive purple speckles and the arms of the plant always form a zig-zag pattern. Come winter it will die off and look like brittle light grey bamboo canes. 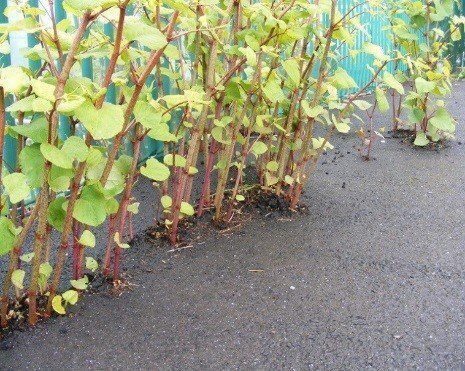 As a highly invasive plant Japanese Knotweed is notorious for being able to break through foundations, concrete, tarmac and bricks. With a root system that can be 3 metres deep and 7 metres in each direction eradicating it is a complex task. Just leaving behind as little as 2 mm of root will allow it to come back. The plant and any part of it are classed as controlled waste. Whilst you are allowed to burn the plant at home before doing so you must allow it to fully dry out on your property before burning it and the remains of this must also be disposed of at a licensed landfill site. However, the majority of purchasers, and those lenders willing to lend on a property that has been affected by Japanese Knotweed, will want to know that the plant has been or is being properly dealt with. It is therefore prudent that you procure the services of a company specialising in the removal of Japanese Knotweed who should provide you with a treatment plan and warranty which can be passed on to a buyer or lender. 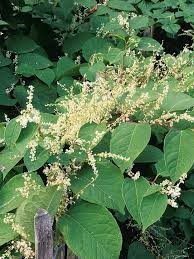 If properly dealt with the existence of Japanese Knotweed in your garden need not spell disaster for you or your home.